When staff log in to their Staff Portals, they are taken to the News tab. To begin taking attendance or working with skills/levels in the Staff Portal, they will select the Manage Classes tab. The classes that are available to your staff when they are logged into the Staff Portal is determined by the settings in the Manage Classes Tab section of the Portal Settings tab in their individual Staff record. For an explanation of these settings refer to Settings for Staff Portal Attendance. 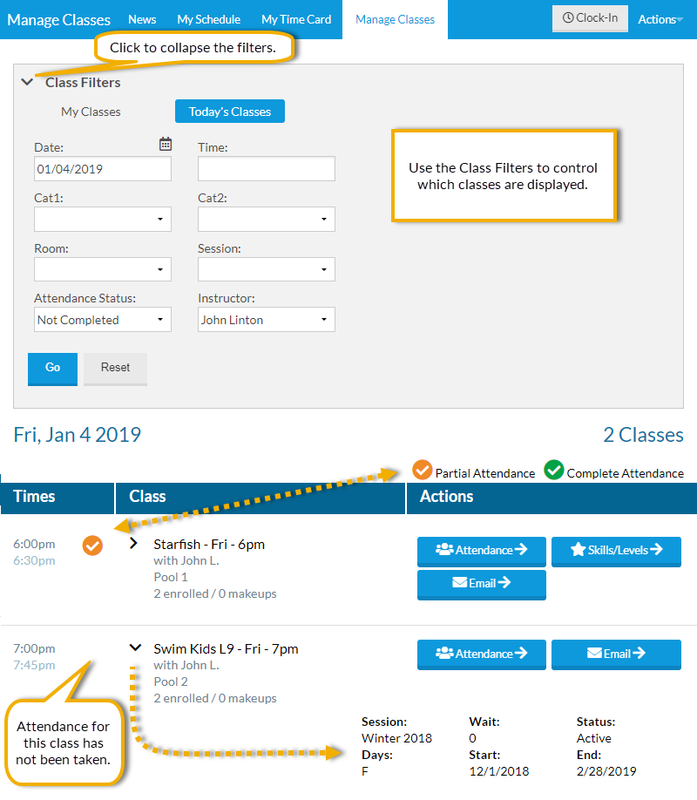 On the main page of the Manage Classes tab, there are several Class Filters available to allow staff to drill down to specific classes including: Date, Time, Cat1, Session, Room, Attendance Status (Completed or Not Completed), and Instructor. When no students in the class have been marked either present or absent there will be no check mark next to the class. When all students have been marked present or absent, a green check mark indicates that attendance is complete. If you allow partial attendance, where staff can mark some students present/absent and save the changes to complete at a later time, a yellow check mark will indicate that attendance for the class has been partially taken. See Settings for Staff Portal Attendance to learn more. Additional class information is available by clicking the arrow (>) next to the class name. To collapse/hide that information click the arrow (v) again. The Email button opens a window where an email can be composed. All enrolled students appear with a check box allowing staff to select which students to include in the email. The message is sent to all contacts in the student's family record in your database. A copy of the email is retained in the Family record, on the Misc tab, for 180 days. When ready to take attendance, staff will select the Attendance button to move to the Manage Classes > Attendance page. If the class has skills assigned to it, a Skills/Levels button will display which will take staff to the Manage Classes > Skills/Levels page.